well... i made it thru my 8 mile run tonight in 1 hour and 29 minutes! a little sore now, but it was a nice run. and now, it's friday! made it thru the week! click here to view all Skywatch Friday participants! What wonderful rays of light! trying to catch some rays? Cool for you, Brian, and your running. Super photo! Fantastic shot. And wow you ran fast ^_^ Happy weekend! 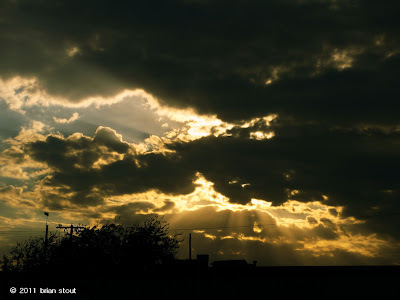 Dark clouds with a golden lining and crepuscular rays. Lovely sunset shot.